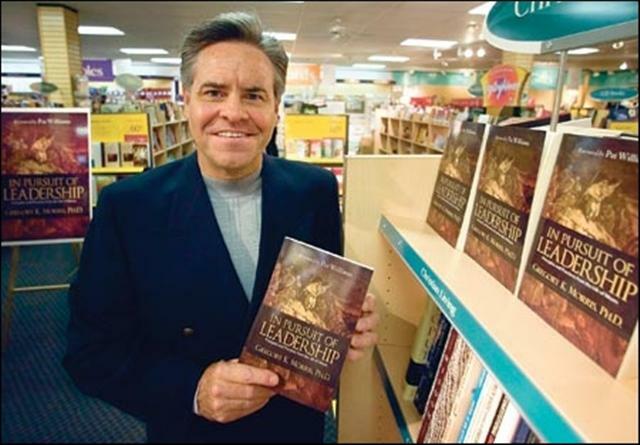 Dr. Greg Morris and a display at Family Christian Bookstore of his book, "In Pursuit of Leadership"
Dr. Greg Morris is a well respected and nationally known authority on Christian leadership. Drawing on more than twenty five years of leadership roles in both business and the church his background uniquely qualifies him to address the challenges of leadership. His writing and speaking ministry over the past decade has touched thousands of church leaders and denominations worldwide. Dr. Morris has served as senior pastor, denominational executive, missionary and college and seminary teacher. Currently Dr. Morris is professor of Bible and preaching at Florida Theological Seminary as well as founder and president of Leadership Dynamics™ and Leadership Press. He has studied at the University of Akron, Wheaton College Graduate School, Trinity Evangelical Divinity School and Louisiana Baptist University. He resides in Lakeland, Florida.